Why review a work of fiction for SPME, which generally relies on the research and analysis of historians, political scientists, demographers, sociologists, and practitioners of the higher journalism to unravel the morass of the Middle East conflict (otherwise known as the Arab war against Israel)? In 2006 Paul Bogdanor and I published a book entitled The Jewish Divide over Israel, which comprised seventeen essays by such eminences about Israel’s “Jewish accusers.” Yet I suspect that our book tells less about these people and their malignant role in the war of ideas over the Jewish state than Howard Jacobson’s new novel, The Finkler Question. The famous English historian Asa Briggs once said that George Eliot’s novel Middlemarch contained “the finest picture of England” that he knew of the time leading up to the 1832 Reform Bill, even though neither the Duke of Wellington nor Lord John Russell appeared in the novel. The explanation for this was given long ago by Aristotle, who said that “Poetry [by which he meant imaginative literature generally] is finer and more philosophical than history because poetry expresses the universal, and history only the particular.” Jacobson, as I plan to demonstrate, does indeed begin with history, but ends in poetry. “When a man can no longer be a Jew, he becomes a Zionist.” -a character named Yudka in “The Sermon,” by Haim Hazaz (1942). “I am a Jew by virtue of the fact that I am not a Zionist.”-a character named Kugle in The Finkler Question, by Howard Jacobson (2010). The Finkler Question is a profoundly serious comic novel. Seriousness, let us remember, is not the same as solemnity; it does not require pince-nez spectacles and grave demeanor. Howard Jacobson’s primary subject is the English version of Jewish hatred of Israel, otherwise known as the antisemitism of Jews in its most recent incarnation. It is a serious subject because Jewish Israel-haters and Jewish anorexics (people who wish to live without a body) play an enormously disproportionate role in the blackening of Israel’s image and the relentless tightening of the international noose around her throat. If they have not set it in motion, they have certainly accelerated a process that may turn out to be the antecedent of a second Holocaust within a single century. Such Jews have already made a large contribution to antisemitic agitprop and the raw violence consequent upon it in England. Jacobson presents both with a specificity, courage and candor rare among Jewish novelists, although they have already been the subject of several books, most notably The Resurgence of Antisemitism (2006), by the philosopher (and ger tzedek) Bernard Harrison, and Trials of the Diaspora (2010) by literary critic and historian Anthony Julius. The novel’s most incisive and severe critic of Finkler and the Jews of shame in general is Finkler’s, wife Tyler-or rather her ghost, because she is already dead when the story begins. Finkler’s bereavement binds him to Libor, who is also a widower, despite their (apparent) disagreement over Israel and blushing Jews. A convert (against her husband’s wishes, of course) to Judaism, Tyler insists that she is the real Jew in their marriage because she knows the difference between culture and biology, religion and stupid ethnic vanity. She sees Finkler and his anti-Zionist comrades as “profoundly self-important” more than “profoundly ashamed”; she knows why Jews pray every morning that “we may never be put to shame”; for her Finkler and his comrades are “shande Jews,” which is to say shame as in “disgrace…they brought shame.” It is she who must explain to the puzzled Treslove the grotesque and brazen fakery of anti-Zionists who insist that if Jews don’t exist as “a light unto the nations” they don’t deserve to exist at all. …Libor had been lucky in love but in politics he was from a part of the world that expected nothing good of anybody. Jew-hating was back-of course Jew-hating was back. Soon it would be full-blown fascism, Nazis, Stalinism. These things didn’t go away. There was nowhere for them to go to. They were indestructible, non-biodegradable. They waited in the great rubbish tip that was the human heart. It wasn’t even the Algerian’s fault in the end. He just did what history had told him to do. God is great…kill all Jews. It was hard to take offence-unless, of course, the blinded boy was your child or grandson. The moviemaker goes unnamed but he is almost certainly based upon Ken Loach. A Trotskyist, Loach collaborated with author Jim Allen to produce the “poisonously” (thus Arnold Wesker) antisemitic play Perdition, which depicted the Holocaust as the product of a Zionist-Nazi conspiracy. We do not learn until nearly the end of the book that Libor fails Emmy because he too had succumbed to the anti-Jewish tsunami, now so powerful in England that both the Jew Finkler and the non-Jew Treslove discover that they have produced antisemitic sons. Libor’s apparent Zionism had been no more than “lifeboat” Zionism, a place of refuge when Europe returned to its default ideology. By the time Emmy asks for his help against the moral desperadoes of England’s artistic/learned classes, he has decided that the Jews must disappear: “I will have no more Jews.” And he practices what he preaches, committing suicide in Eastbourne. 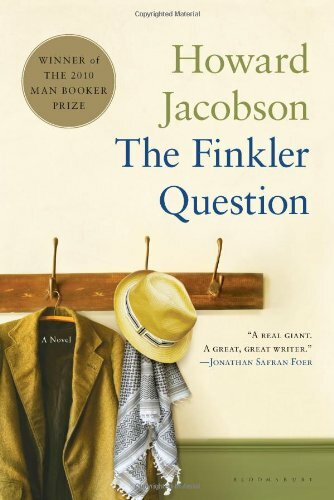 The Finkler Question is not quite the literary masterpiece that numerous reviewers have declared it to be. It is full of verbal tics, small jokes that are amusing when first told but become cloying by the fourth or fifth repetition, and resort to words (like “methodology”) that usually betray a virgin mind seduced by the temptation of a few extra syllables into saying what the writer does not mean. Nevertheless, the work has what John Ruskin called “noble imperfection” and a great truth-telling power. The last few pages of this comic novel include the following: the suicide of Libor; a somber gathering at his grave in London; the near lynching of a Sephardic Jewish boy in Regent’s Park; the opening of a Museum of Anglo-Jewish Culture in St. John’s Wood attended by twelve people, a greater number of anti-Israel demonstrators led by “the Jew in the PLO scarf,” and watchful police; a recitation of the Kaddish. The very English Jacobson appears to have adopted the wise slogan of his cross-channel neighbors: Il faut rire pour ne pas pleurer. Edward Alexander is the co-author, with Paul Bogdanor, of The Jewish Divide over Israel: Accusers and Defenders (Transaction Publishers).